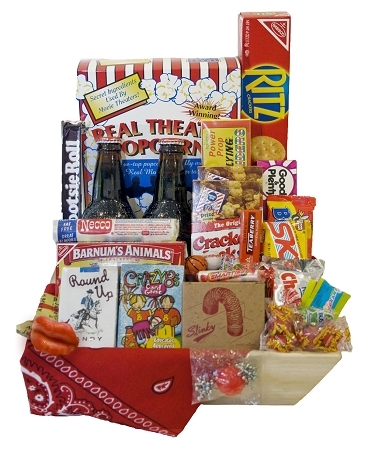 Sweet Nostalgia Candy Gift Basket BRING BACK THE PAST WITH A COOL NOSTALGIC BLAST! This candy gift basket is a over flowing with retro goodies galore from candy to toys! Great for birthdays. 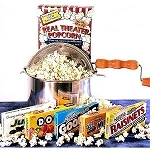 Give your taste buds a spin back in time with - Necco wafers, Tootsie Roll, Mary Janes and Goetz caramels ... Vintage soda, animal crackers, Cracker Jacks and wax lips, Ritz crackers, a large assortment of vintage candy, a Slinky, set of jacks and ball, plus 5 servings of Real Movie Theater Popcorn. Reminisce with the a toy glider plane and a deck of Crazy 8's. The Sweet Nostalgia Candy Gift Basket comes in a gift basket and includes the matching GiftProse card and prose along with your personalized sentiment. *candy substituted depending upon availability. Wander back to days gone past and savor your reflections … it was such a blast that went by too fast but we love our recollections!